Seen it but haven't boughten it? shame on you! Get to eat it all the time? OOOh I'm jealous of you! 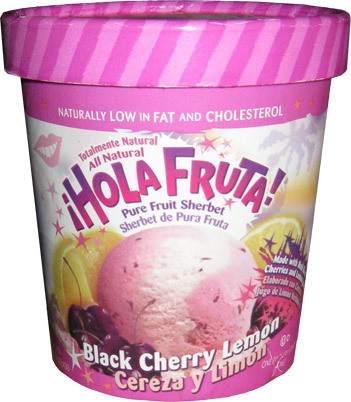 It's been a long time since I've praised my love of Hola Fruta but that's because no one carries it around here. Shaws did carry it long enough for me to get hooked, but then it disappeared never to be found again, until now... at Wegman's! YAY! I had four pint-sized flavors to choose from and it was this newer looking black cherry lemon sherbet that really got my attention. ($2.49 a pint) Oh it's so nice to have an all natural pure fruit sherbet in my grasp once again. I'm so excited!! I wasted no time digging in... to the wonderful black cherry side. Notice there is only one scoop of lemon missing, and that's because OH MY BLOODY WORD is it POTENT. Sorry for yelling, but my taste buds were screaming in retreat of just how pure and tart the lemon sherbet was. I mine as well pour lemon juice in my milk because that's effectively how this tastes. 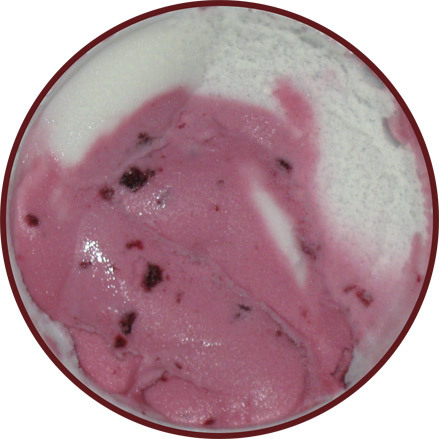 I painstakingly scooped out the enjoyable black cherry sherbet and left all the lemon. Sure I tried a mixed bite of both from time to time, but it's just way too powerful for my weak fortitude.... was it wrong to pawn this off on my daughter? Maybe... actually, I went to dispose of it and she said she wanted to try it. It was too tart so we buried it in whip cream and she mixed it all together. She says it's not bad but we add some more whip cream... she tried a few more scoops and then she gave up. Oh well, she put up a good fight, but it's time to retire this one. Note: Looks like this came out at the end of 2010, but it also looks like it replaced my beloved Raspberry flavor! Oh Nooooooo!